The John Fluke Model 8522A Digital multimeter is designed for use in an automated test system or for use as an independent device. The 5-1 / 2 digit instrument can be operated locally from the front panel or remotely via a BCD/Parallel (remote) Interface. The 8522A can directly measure dc, ac, and ac 4-dc voltage; resistance (both 2-and 4-wire); and conductance (the reciprocal of resistance). While the range of measurement can be manually selected, all functions except conductance (nS) have full autoranging capabilities (conductance only has one range). When measruement function and range are selected, the 8522A automatically programs the reading rate and filter for optimum measurement accruacy. Other values for reading rate and filter can be manually selected. The seven math programs allow more sophisticated processing of measurement data (such as computing the peak-to-peak value, percentage of deviation, rise time, etc.) and additional measruement functions. For example, the standard 8522A can make voltage ratio measurements and an 8522A equipped with the -010 Option can make voltage ratio measurements, dB measurements, and temperature measurements in addition to the direct voltage and resistance measurements. The burst feature of the 8522A allows the operator to capture up to 50 readings (400 with the -010 Option) at various reading rates and to display the readings at a different rate, to delay the time after a trigger before the readings are taken, or to look at what happened to the signal before the trigger occurred. The TRIGGER controls allow internal triggering, manual triggering via the remote interface, and triggering from an external source. All measurements can be guarded. DC voltages can be measured from 1 (xV up to 1000V in five ranges; 100 mV, IV, I0V, IOOV, and 1000V. AC and ac + dc voltages can be measured from 10 juV ac rms to 650V ac rms in four ranges (IV, 10V, 10GV, and 650V acrms) over the frequency range of 10 Hz to 1 MHz, Resistance can be measured in two ways. Hither directly using the 02 WIRE and 04 WIRE functions or inversely using the conductance function. The 02 WIRE and 04 WIRE functions provide measurement of resistance from 100 microhms to 20 megohms is seven ranges: 10 ohms, 100 ohms, 1000 ohms, lö kilohms, lOOkilohms, 1 megohm, and 10 megohms. Conductance provides fast, accurate, noise-free measurement of resistances from 10 megohms up to 10,000 megohms in a single range, 100 nS. Conductance is displayed in Siemens (international units) which is equal to the reciprocal of ohms (S = I/O). The standard 8522A has seven math programs: #1	TEST	Four diagnostic self-test programs. 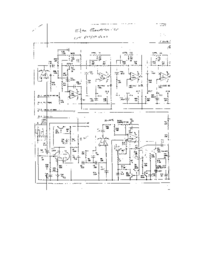 #2 ZERO	Automatic meter zeroing for dc voltage offsets and resistance offsets (such as test lead resistance). XREF	Ratio between the input voltage and an external reference voltage. OSR	Subtracts an offset (OFST) from the input, multiplies by a scale factor (SCAL), divides by a ratio factor (RATO), and displays the result. A PCT	Displays the percentage deviation of the input with respect to a stored nominal value. PEAK	Captures upper and lower peak values and computes peak-to-peak value. Tests the reading against stored upper and lower limits and displays the results of each reading, the number HIGH, the number LOW, the number that PASS, and the TOTAL number of readings. 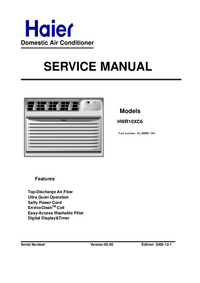 The information in this manual, 8522A Operator Manual, is divided into nine sections:	1	INTRODUCTION AND SPECIFICATIONS	Introduces both the 8522A Digital multimeter and the Instruction Manual Set, and lists the instrument’s specifications. 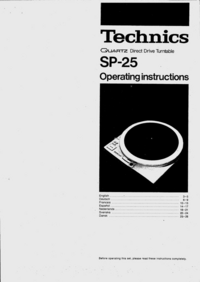 2	SHIPPING AND SERVICE INFORMATION	If there is a problem with your 8522A, this section tells you how to get it corrected and how to ship the instrument. 3	INSTALLATION AND MAINTENANCE	How to physically install the 8522A — including connecting line power and the remote interface. 4	FAMILIARIZATION	Describes the location and basic function of all instrument controls, connectors, and indicators. 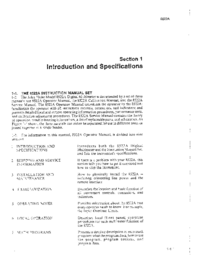 5	OPERATING NOTES	Provides information about the 8522A that every operator needs to know. For example, the Input Overload Limits. 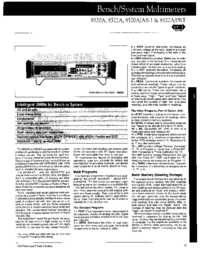 6	LOCAL OPERATION	Describes local (front panel) operation procedures for each multimeter function of the 8522A. 7	MATH PROGRAMS	Presents a detailed description of each math program: what the program does, how to use the program, program options, and program data.